New Juniper owner seeks advice. Just found this site, and have learned bunch of great stuff allready! What a great recource. Anyhoo, a while back I casually mentioned that bonsai growing seems pretty cool. Much to my suprise I received my first "bonsai" as a birthday gift yesterday! Since then I have been doing some research on growing/watering techniques etc. 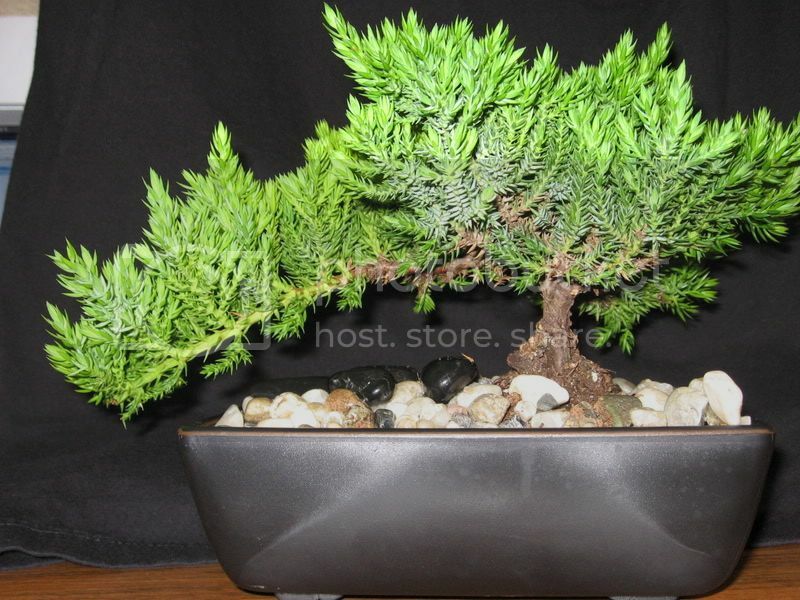 In looking around the net, I found out that what I have isnt really considered a bonsai by enthusiasts, but more of "a small clipping that was glued into a pot and sold." Despite reading this, im still pretty excited to give it a try and transform it (hopefully with out killing it) into a true bonsai. I believe the tree is a juniper, and it seems to be pretty healthy (new growth is evident). I also realize that soil is a very touchy subject and almost everyone will probably have a different opinion. I just thought I would get your guys opinion. (I live in Northern Ca by the way). Should I just go with this, something else, or should I check a local nursery? Once I get the soil im going to change it, and examine the roots and trim if needed. Anyways, just thought I would get your input! 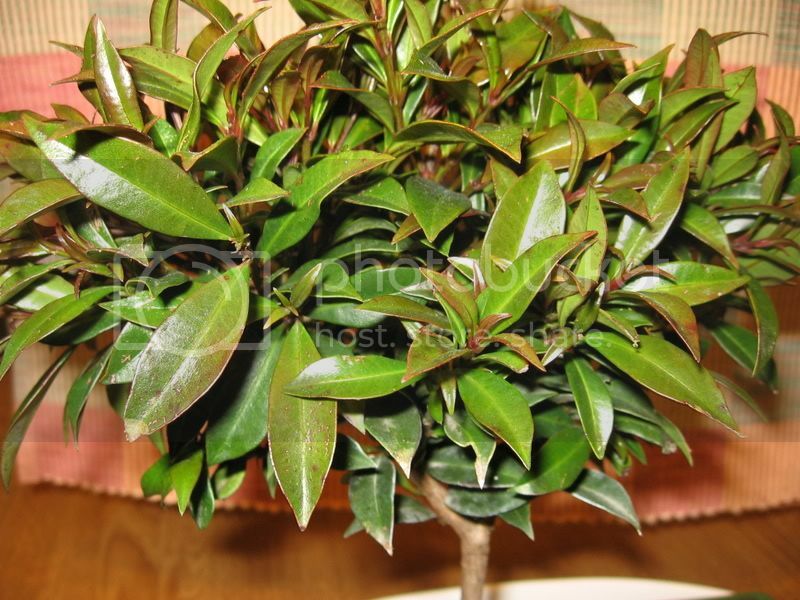 So far I really am enjoying checking out a bunch of info on growing bonsai trees. 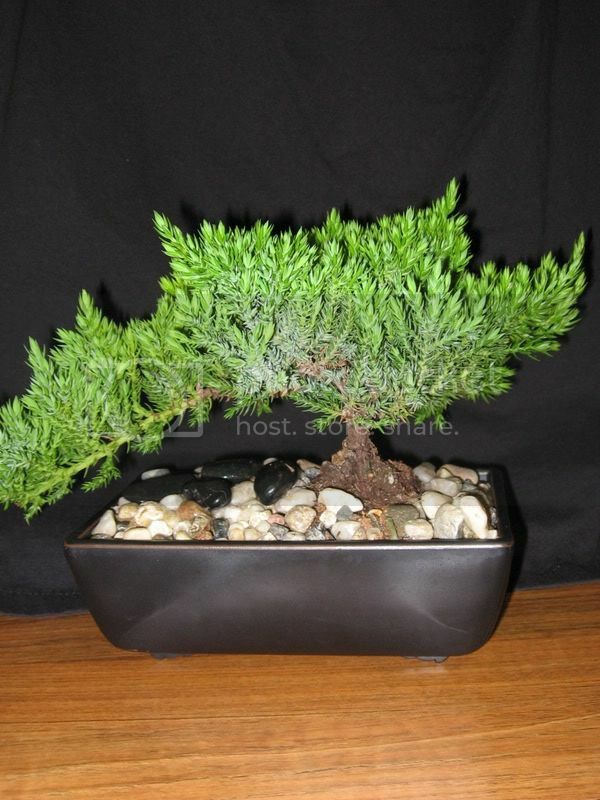 I think this will be a great way to get me into the hobby/art of growing bonsai trees. Thanks! Re: Hey Guys. Just got my first bonsai! Just found this site, and have learned bunch of great stuff allready! I am glad to hear you have been checking out some info on your new buddy . It is a Juniperus Procumbens nana, A healthy one at that . As I bet you have discovered during your research this is a tree that lives outdoors all year long. Hereis some basic info on your species. And hereand here are two pages FULL of articles about different aspects of bonsai and their care. I suggest checking out the ones on soil and watering on the bonsai4me site as they are especially relevant at the moment, All of each site is worth reading [and re-reading] though. What a great recource. Anyhoo, a while back I casually mentioned that bonsai growing seems pretty cool. Much to my suprise I received my first "bonsai" as a birthday gift yesterday! Belated Happy Birthday to you . Bonsai can be an excellent gift [To someone that is interested and willing to learn a bit about their care, NOT so great otherwise..] But they are a bit like keeping a pet in their maintenance [Care is not required everyday- But you do need to check them every day. Since then I have been doing some research on growing/watering techniques etc. 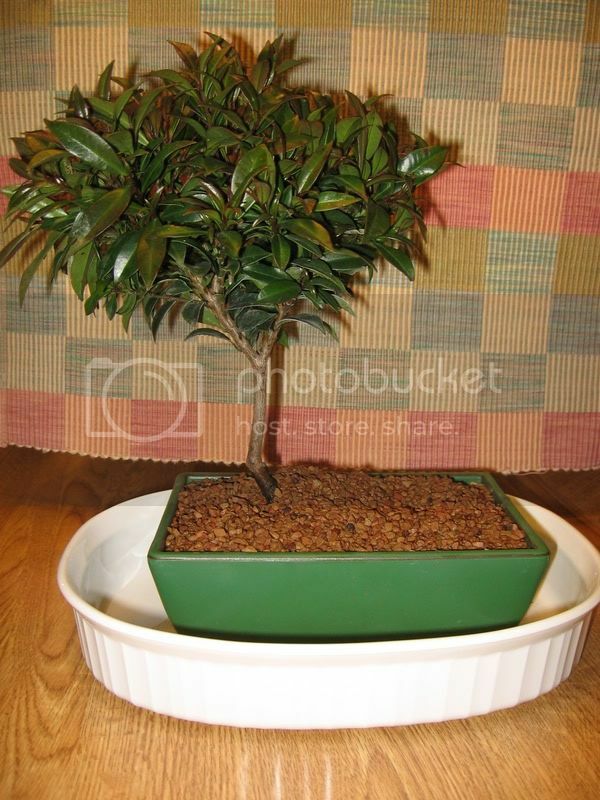 In looking around the net, I found out that what I have isnt really considered a bonsai by enthusiasts, but more of "a small clipping that was glued into a pot and sold." True enough that what you have is considered *'malsai' but there is nothing intrinsically wrong with that. It might be more accurate to say there is much much more to bonsai than malsai. The problem is that since the publics exposure tends to be limited to seeing these varieties/styles/sizes of trees at the stores I mentioned, It then becomes those types of trees that people think of when they think of bonsai. This erroneous & narrow public definition of bonsai is frustrating as so much more is possible, Look here to see what I mean. Malsai are still a good way to practice your horticultural care while you research more and see if you would like to continue. Despite reading this, im still pretty excited to give it a try and transform it (hopefully with out killing it) into a true bonsai. I believe the tree is a juniper, and it seems to be pretty healthy (new growth is evident). I allready removed the rocks that were glued on the top, "pinched" off some of the shoots that were growing downwards, and realize I need to replace the soil cause this stuff is probably pretty bad. I must say, You are way ahead of the curve so far..
As it is mentioned in one of the stickeys: Soil is easily the MOST debated topic in bonsai and something that IMO is often needlessly complicated which makes it even more difficult to grasp. Wrt the HCB soil, I have never used it as I mix my own soil. I have heard good things about it from people I trust. Be careful... You might get addicted .. It happened to me..And I am not the only one .. I would like to thank YOU for bringing some info with you to the forum. It's obvious that you have done some googling and web surfing to gain some understanding/knowledge and that action speaks loudly about your interest. Surprisingly few people do that to any great degree... So Thank You . Thanks for the great post ynot! I looked at those links you mentioned; talk about a wealth of information! As I bet you have discovered during your research this is a tree that lives outdoors all year long. Here is some basic info on your species. Yep. It is so interesting how incorrect the small information card was that came with the juniper. It said it is an indoor plant, and is to be watered by the submersion method... O well, I learned that you cant trust those things! Yeah, I figure you gotta start somewhere, right? I think it will be a good learning experience and something to practice on. As for my green thumb, im new to the horticulture business so I will just have to wait and see! That is encouraging to hear. When I first started looking up infromation on bonsai, I was more than a bit overwhelmed! The amount of different information available is insane! Like you said though, it is a constant learning process that takes time. As far as the soil, i think im going to go for the stuff on the website that I mentioned. Since my nursery is not specifically a bonsai nursery, I bet this will be better than what I could find locally. Im going to go order some now! Thanks again for all the help! I appreciate it. Ill keep you updated, and im sure I'll have more questions for you in the near future! So I went out today and got the Aquatic plant soil that was recommended. 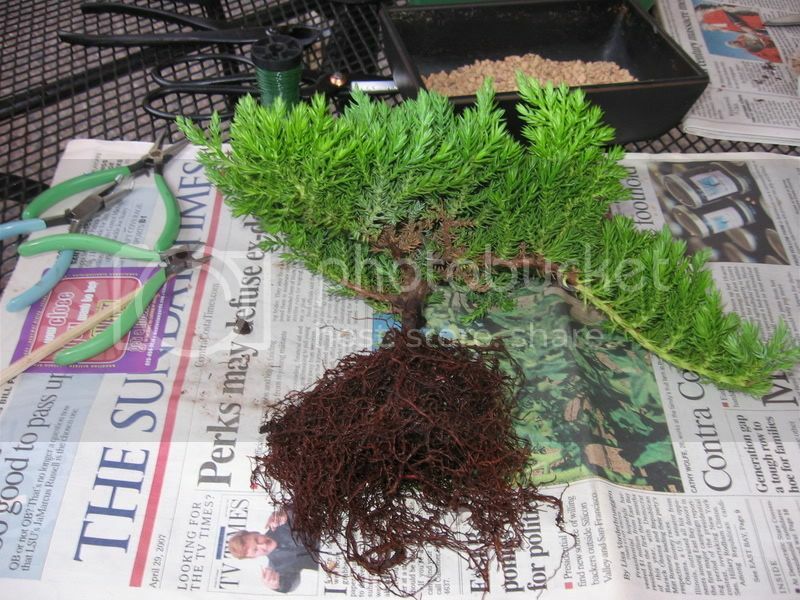 Changed the soil and gave the roots a trim on my juniper. Since it was my first time, i was a bit hesitant about how much to trim. I have pics, but don't have the memory card on me at the moment. Ill post pics of my root prune a but later. Also a friend had a malsai that he didnt want anymore. It was pretty cool looking, so I took it off his hands. Took the rocks off, and changed the soil to the sifted aquatic stuff. Looks pretty good. The only thing was I couldnt quite get the roots completely untangle and free of the old dirt. I got lots off, bit towards the end, i felt like i was being too rough on the roots trying to get them real clean, so i stopped. Not sure what kind of plant this new one is. Here are some pics of it, along with the new aquatic plant soil! Anyone know what it is? So I went out today and got the Aquatic plant soil that was recommended. Is it 100% only this in the pot? It's possible you have a Brush Cherry [Eugenia Myrtifolia - Not a real cherry, But very common as malsai.] there and [being a tropical] a 100% inorganic soil is not appropriate for it. The only thing was I couldnt quite get the roots completely untangle and free of the old dirt. I got lots off, bit towards the end, I felt like I was being too rough on the roots trying to get them real clean, so I stopped. This is a problem because the arcilite will retain water at a different rate than the original soil. Meaning if you water enough to keep the arcilite wet- The native soil will be Soaking, And that eliminates the benefits of the better soil. Did you use running water to help remove it? What percentage of the rootball is still in the original soil? I am not real sure what you mean by 'real clean'. I look forward to the photos as it is difficult to tell how concerned to be about this without this information. What did you sift with? Repotting is easy isn't it . Yep, it is 100% inorganic stuff in this pot. Didnt realize that it needs a mix for tropicals (didnt even know it was a tropical haha). What do you recommend I mix it with, and about what ratio? As for the root ball, I got most of it out but some dirt is left in towards the center of the ball. I did use running water to help remove it, but it was still a tangled mess! As for sifting, i had an old sifter out in the garage. Not quite sure if it was coarse enough, but tried to use the bigger stuff. Just read my other post and saw that you recommended adding bark chips. (about a ration of 2/3 O/IO. Thanks for the info. If i pull the plant back up again to add the chips will I kill it do you think? Anyways, Im gonna go pick up some bark chips. cobra wrote: As far as the soil, I think im going to go for the stuff on the website that I mentioned. Since my nursery is not specifically a bonsai nursery, I bet this will be better than what I could find locally. Im going to go order some now! DO hit up the websites I linked you to previously and hit up some research ok. .
As far as 'will you kill it'.. Well, Repotting is stressful to the tree but in all honesty the additional organic amendment to the soil is required in this case I think. It will give you a chance to remove the original soil also. Everything will be fine, Or it will die. It's that simple...Of course this goes for all trees everywhere actually.. ..It never ends, But simply keeping them alive is actually pretty easy, Provided you learn how...And you are learning exactly that. Yeah I decided not to go for the stuff on the internet for two reasons. 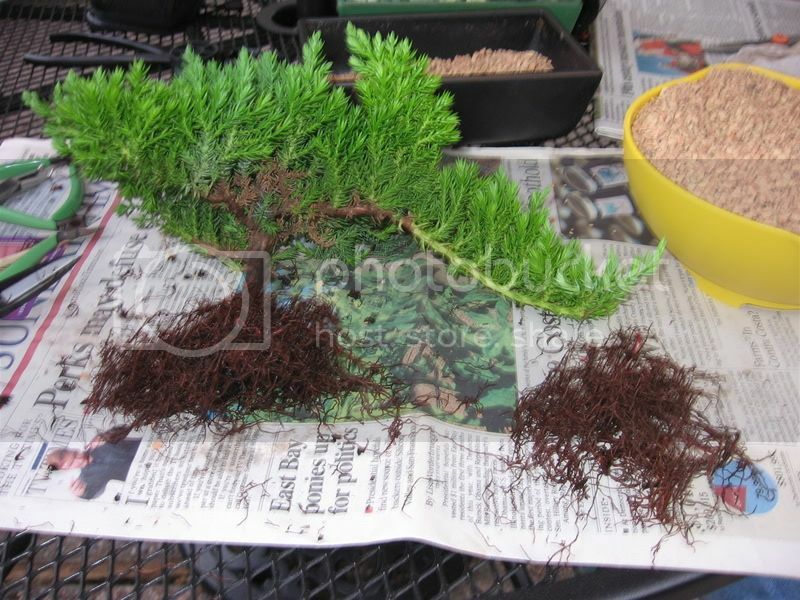 1- I read about the thread on the aquatic plant soil and how it works well for potting bonsai. 2- Shipping for the soil online woulda been real expensive so I figued if i can get it locally, why not? As for the bark, I was able to find some and mixed it 2 to 3 with the inorganic stuff. This gave me anoter chance to remove more of the old soil around the roots. I ran it over water again and slowly worked it. Much better this time. Ill post a pic a bit later when I upload the pics. Ill try to get those up later tonight. Thanks again for the info ynot. cobra 198 wrote: 1- I read about the thread on the aquatic plant soil and how it works well for potting bonsai. 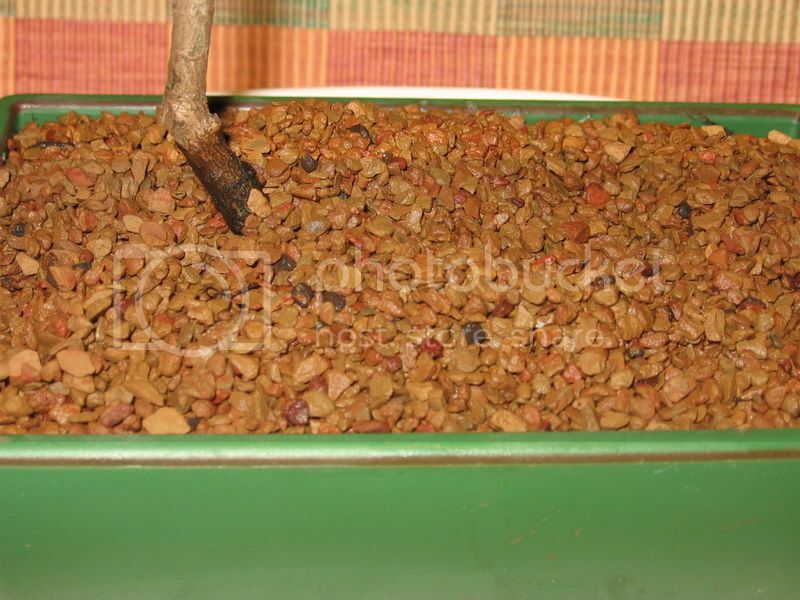 I look forward to the pics., Good to hear about the re-rinse being effective:D.
It is an important thing to note that Aqua soil is recommended as a component of bonsai soil, Are your bark bits sized/screened to the same/similar size? Here are some pics of the roots. This is before the second washing. You can see some dirt was left inbetween the nebari but I got it good and clean! ...That looks like almost a 50% reduction of the root mass. Also to clarify something for you: The nebari are a trees surface roots, The ones that show from the base of the trunk and disappear into the soil. Not simply the root ball itself. When you pruned the roots of the juniper... Where they white on the inside? Their color concerns me a bit. Thanks for the clarification. I was a bit confused with the terminology. Hmmmm. No, I believe the entire ball looked similar to this color. I didn realize it was an issue. I just thought that the particular type of tree has this color of roots. 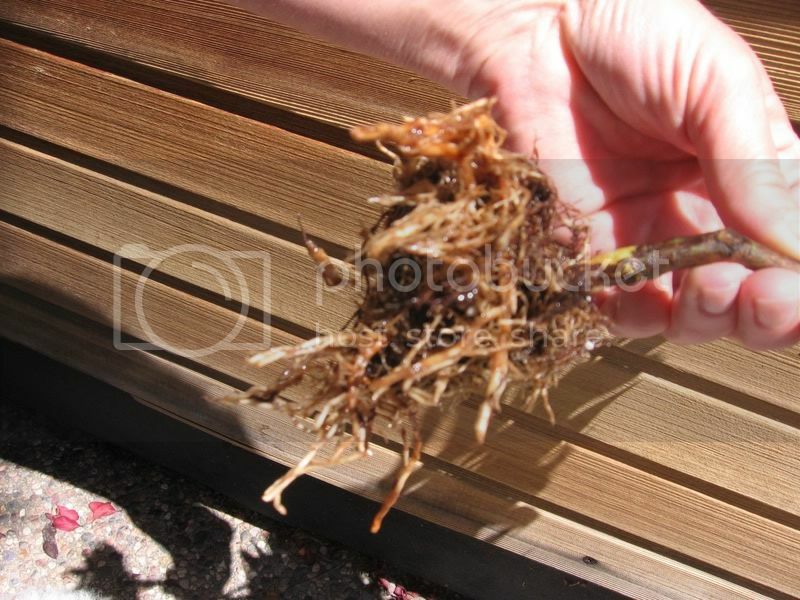 The roots were very very thick with tiny roots, which i thought was a good thing. What do you think this discoloration means? cobra 198 wrote: Hmmmm. No, I believe the entire ball looked similar to this color. I didn realize it was an issue. I just thought that the particular type of tree has this color of roots. The roots were very very thick with tiny roots, which I thought was a good thing. What do you think this discoloration means? 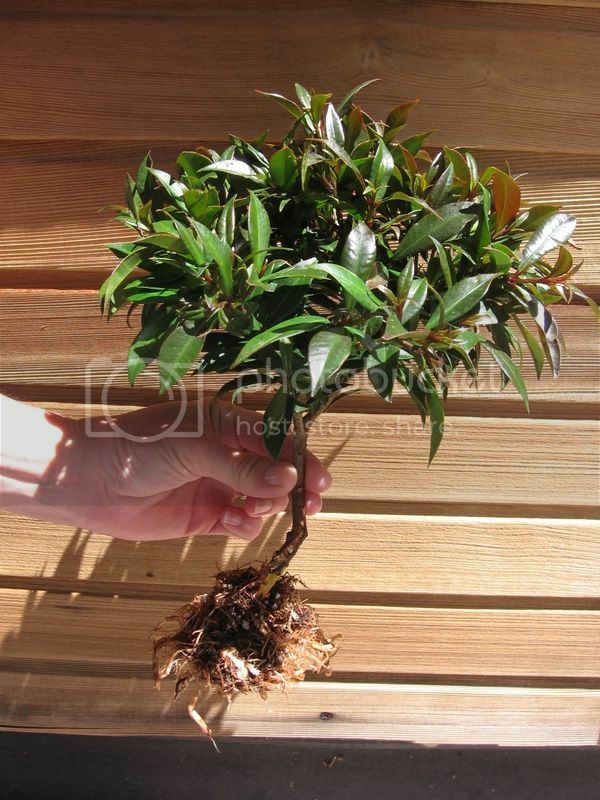 The rootball is not what I refer to, I mean the individual roots that you actually cut. I hope it survives the root reduction also. , Learn on! It's different for each species BTW and you will learn to err on the side of caution after you loose a few trees. :shrug: lol - I am not trying to be mean there by any means. Just being honest that the way most of us learn what 'too much' is....Is by root pruning too much... Part of the process/learning curve I am afraid and tree deaths come with the territory..
O, I thought you were talking about the roots closer to the center of the ball. From what I can recall the roots were lighter in the center when I cut them. The roots were pretty firm, and not slimy also. So far all the plants seem to be responding pretty well (atleast from what I can tell). The brush cherry is loosing a few leaves, but nothing too crazy at the moment.... I have my fingers crossed! I understand, thanks for being honest cause thats the best way for me to learn. Now I have a better idea about how much to remove, and wont get carried away hopefully!